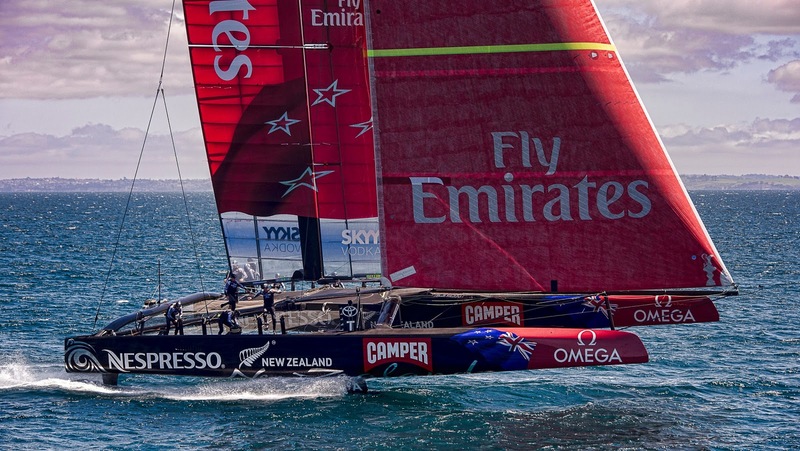 No possible argue here, Emirates Team New Zealand is the 2012 Boat of the Year. 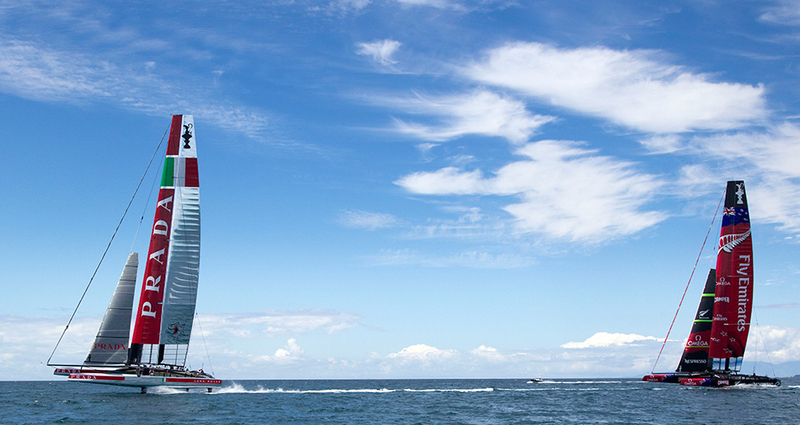 An incredible piece of engineering, a flying racing Cat for the Americas Cup. Right now the Epitome of racing boats of the ages. 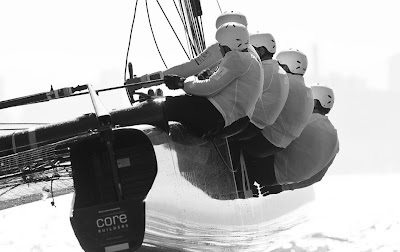 Still to be proven in the LV and the ACup Finals, but watching how difficult is for the other teams to even sail their boats, it is clear by now that ETNZ AC72 has engraved its name in capital letter in the history of sailing and the ACup. - Olivier Backes: 2010 F8 World Champ with Arnaud Jarlegan, couldn´t participate in 2011 Worlds due to job commitments, but he came back on December 2011 to win the '2012' Europeans at Canaria with Arnaud. - Mischa Heemskerk: After years of high performance and top three podiums on the F18, with some missed titles in the process, Mischa started sailing in the A-Class in 2011, at the Worlds held at Aarhus. The progression of his results in that event was impressive, a clear sign of his potential. 1.2 The Australian F18 Catamaran Class rules. 2.1 Boats may be required to display bow numbers and advertising chosen and supplied by the organising authority. 3.2 All competitors shall be members of their National F18 Association, and their current year membership fees shall have been fully paid and verified. 3.3 Any competitor under the age of 18 years will be required to obtain parental/guardian consent prior to commencement of championship. 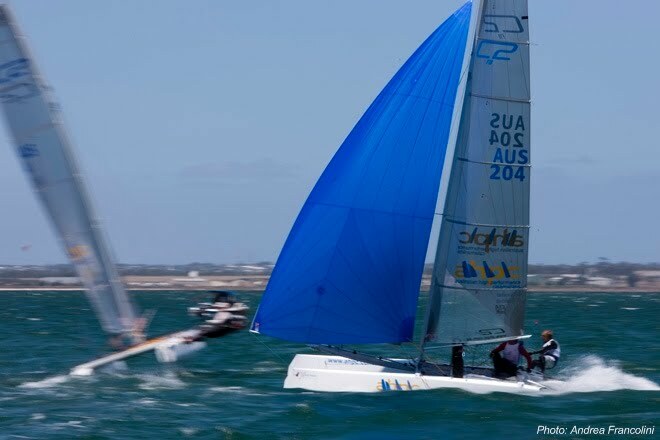 3.4 The regatta is open to all boats with current measurement certificate of the F18 Catamaran class, Please note no measurements or certificates will be issued at the event. 4.1 Eligible boats can enter by completing the online entry form on the F18 website at www.ausf18.org.au Entry will be open as of 1st November 2012 and close 15th January 2013. Fees will be at the following rates and payable day of registration 25th & 26th January 2013. 4.2 The F18 Catamaran Class will be allocated there own division. 5.1 The required fee is fixed at $140 per boat. Late entries accepted or received after 15th January 2013 will be charged an extra $50. 5.2 After 15th January 2013 deadline, late entries may be accepted at the discretion of the organiz ers. Late entries will be charged an extra $50. On top of the noted fees in item 5.1. 6.1 The regatta will be held on the enclosed waters off Mannering Park Amateur Sailing Club on the waters of Lake Macquarie NSW. 7.1 Registration: Friday 25th January 2013, from 17.00 to 20.00 and Saturday 26th Jan 2013 from 8.00 to 9.30. 7.2 Measurement and inspection: Friday 25th January 2013, from 17.00 to 20.00 and Saturday 26th Jan 2013 from 8.00 to 9.30. Practice race course may be set up if resources allow. 7.4 Number of races 10 max. 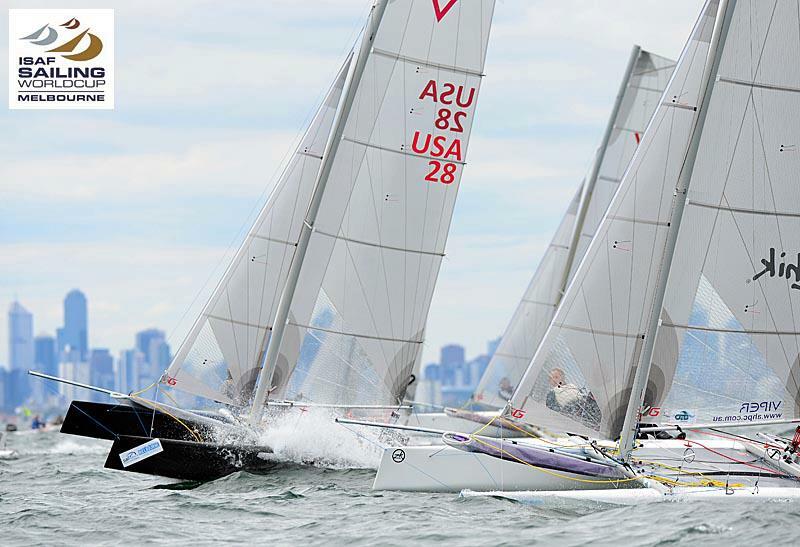 Rules comment: Winglets on A-class daggerboards are illegal. One should be able to lift boards through the top of the daggerboard case. The French Olympic Mixed Team and World Champ couple (F18 / 470) dedicating time to send some good vibes. 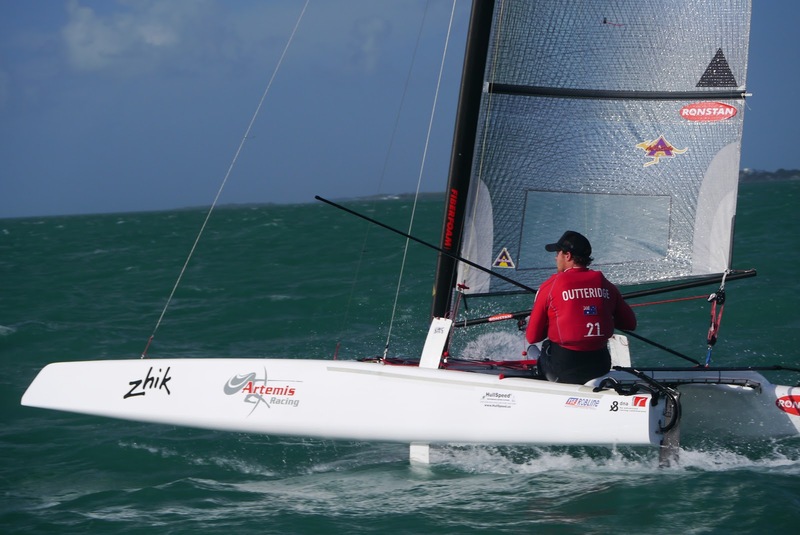 The Flying Austrians.. Thomas Zajak & Tanja Frak continue their training on the Nacra 17, now they've raised a little their daggers in this sequence and they look fast, lots of hours pending to control it, but they will final manage the perfect trim. From what I'm seeing in the video it seems you'll need to be more proactive with the mainsheet to regulate the bow height, releasing gradually as you feel the bow goes up. The curved boards offer a great power ratio, would love to see what a pair of winglets can do to stabilize those downwind flights. Team website is https://www.facebook.com/goforgold2016 . Check video below. Some anon comments already throwing bad vibes have been blocked, as we will not have another bs crossed anon accusations escalade like with the Olympic trials. You can review this site to found any critics to new projects, you will find None, zero... just takes on the big guys, as again, they wont mind a blog's opinion. Thomas and Tanja had some issues with their equipment but I still have to find a builder with a perfect record. When I made last interview with Gunnar, I told him that with the selection they were also acquiring a huge compromise and responsibility on their brand and the entire community. So as they are starting to deliver boats on time surpasing delivery times, the key will be customer service. And I know they are already on to it. 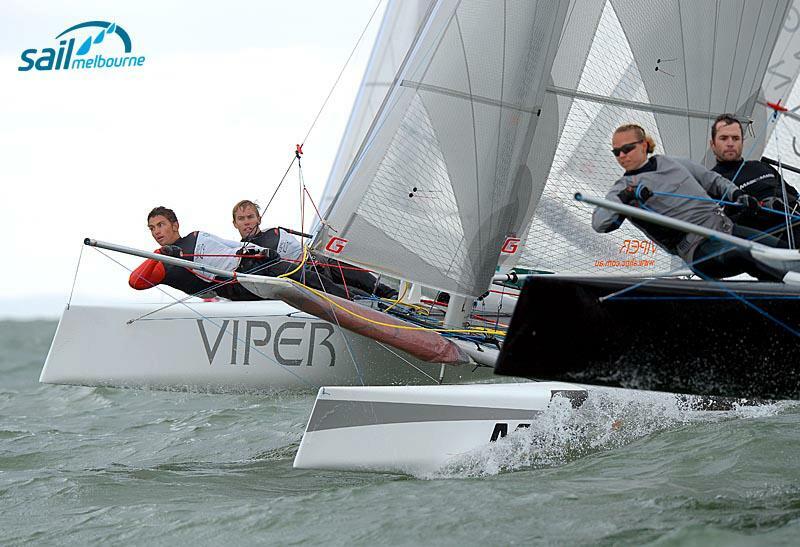 The boat is a blast to sail and it is going to be a good challenge for Olympic sailors. Last Post before the New Era? It seems the Aussies are still alive, Dec 21, 2012, and all clear on the Eastern front. Really a great year for sailing, for me some of the best racing days ever were from October 2011 when we had our first F18 South Americans with 20 boats, to Sept 2012 where I attend my first F18 Worlds at LA along 10 other Arg boats, great end of the local class first cycle that we started here in 2006. 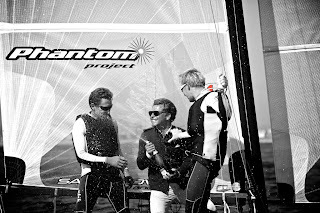 For 2013 the F18 Open Project will be a priority, as right now I don´t even have a boat! The Olympics are full on with new teams training hard, the Americas Cup is going to be the greatest ever whichever the result, as seeing those beasts racing is going to be Epic. 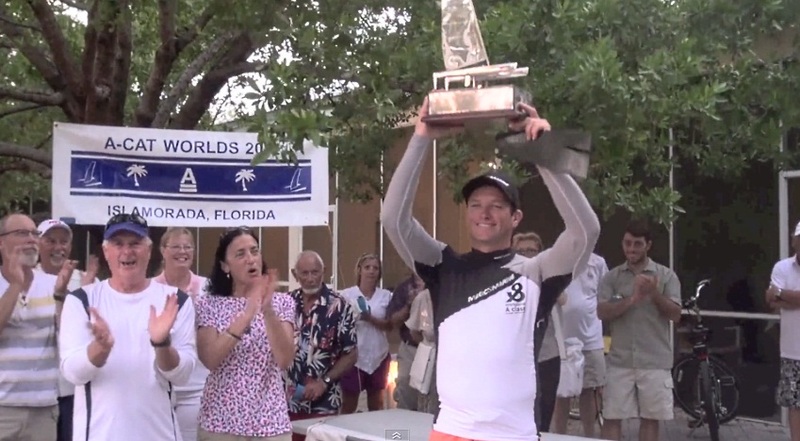 Next goal is to be the first Argentine to race in an A-Class Worlds, I'm already the first to participate in a Hobie 16 one, back in 2004 at Mexico. C-Class next? The importance of being the "first" is only related on opening new paths and alternatives as we did here with the F18, looking upto legends in the big leagues like Santi Lange, that inspired a new generation to sail Cats in Argentina with his Tornado Olympic Campaigns, as Darren Bundock and others did at international level. I'll try to keep their legacy alive promoting the sport, God Willing. Image Jasper Van Staveren, Falcon F18, Formula 18 Worlds 2012, Long Beach, California. By Nicolas Felix/Will Clark -- C Class Cup. Quiberon, France (December 19th, 2012) - At the 2012 International Boat Show in Paris, Challenge France, the French challenger for the 2013 International C Class Catamaran Championship (ICCCC) in partnership with the French National Sailing Centre (Ecole Nationale de Voile et des Sports Nautiques - ENVSN), announced details about the C Class Cup: the first French C Class Catamaran sailing event. Image Christophe Launay. 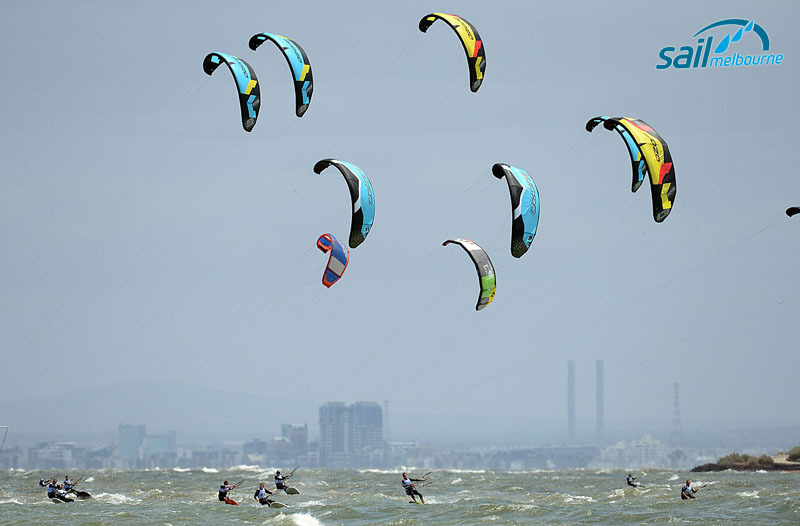 The C Class Cup will take place at the ENVSN – Saint-Pierre-Quiberon, France, from 22nd to the 26th of May 2013. 4 sailing teams already registered for the C Class Cup including Swiss team HYDROS with Jérémie Lagarrigue, the French GROUPAMA team with Franck Cammas and the French CHALLENGE FRANCE team with Karine Fauconnier and Gwénolé Gahinet. The event lasting 4 days will include 3 types of racing format: Fleet Races, Match Racing and Speed Matches. 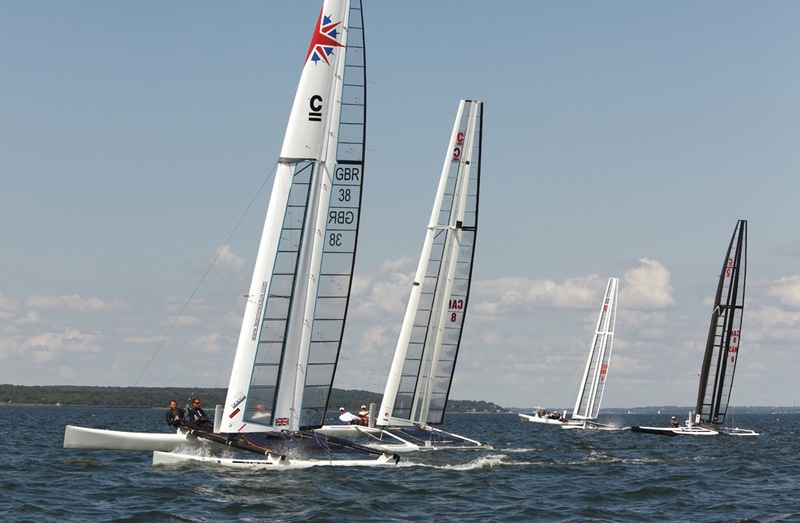 It will be a unique opportunity for the teams to compete, train and see how their boats measure up in the same sort of environment that they will encounter during the ICCCC, the class’s world championship in Falmouth, UK in September 2013. 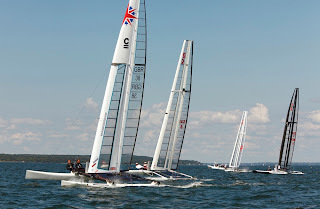 The C Class Cup promises to be an important event in the spring of 2013. To support the promotion and organization of the C Class Cup, the organization is seeking a title sponsor and technical partners. 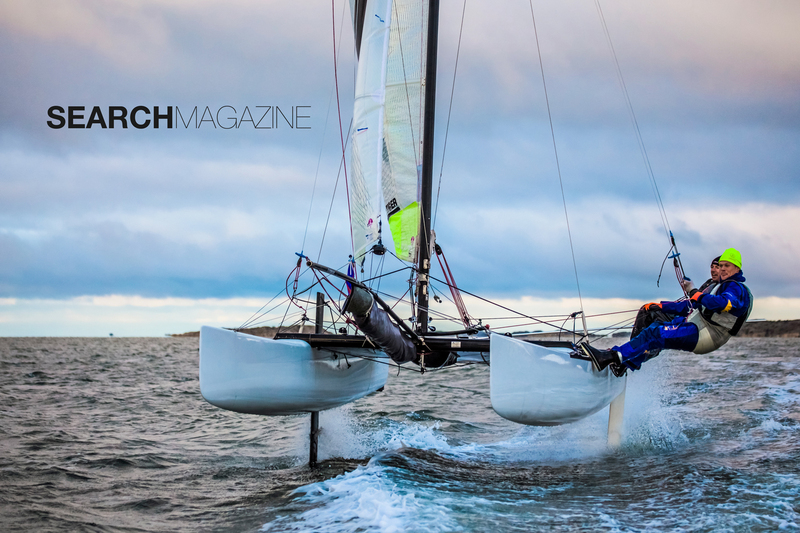 "France has been at the vanguard of multihull development for many years, yet has been absent from the C Class competition which has always been the most advanced multihull class [...]. We hope this regatta is the start of a new union between the French passion for speed and development with the C Class which has been the principle proving ground for new multihull technology." I've been seeking for this the past weeks. So now Andy Scheurer and Dominik Scheurer have released a clarification on the recent launch of the new D3 A-Class Dominik is working on. 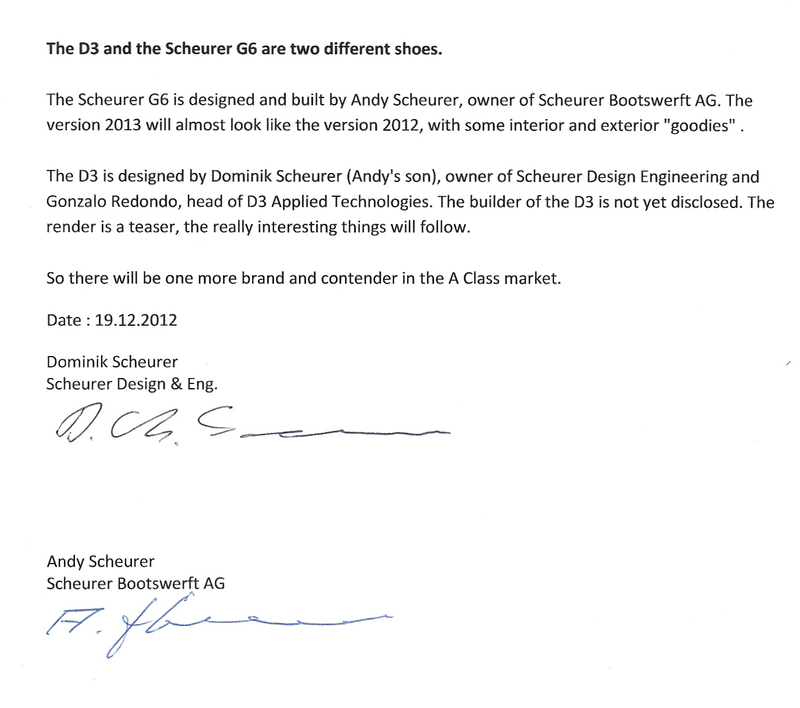 Bottom line: Andy Scheurer G6 will continue production and Dominik with Gonzalo Redondo, head of D3, will launch a new different A-Cat, the 'D3'. Left joint signed communication. Click to enlarge and read. 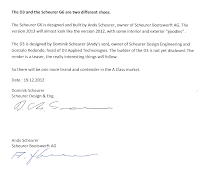 Andy Scheurer from Scheurer Bootswerft has informed that Andrew Landenberger will race the "Scheurer G6" in Barcelona next season, boat currently under construction. These guys are Good. Beyond final results on the LV and the Final, Emirates Team New Zealand is carrying over a perfect development and sailing program. Bactk to sailing the SL33s, check how smooth they are flying, just like her big sister on the Hauraki gulf. 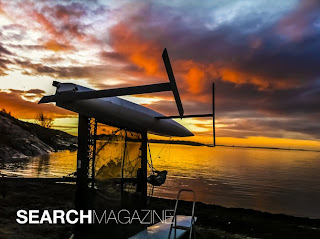 They first start testing their foiling solution on the Morrelli&Melvin designed SL33, and now after a successful run on the AC72, they are going back to the small cat for more research and training, as the 30 sailing days assigned to AC72 were fully used. I'm currently uploading a selection in CSN Fb page. Later a Poll. Image Guilain Grenier. The best design deal in this Cup has been achieved by Luna Rossa. They did and excellent move trusting the Kiwis. Imagine if they would have made the same deal with OR or AR? Someone at the Italian team would be jobless by now. But they make the right decision with ETNZ, and the joined project is by far a great advantage right now on the other two teams. 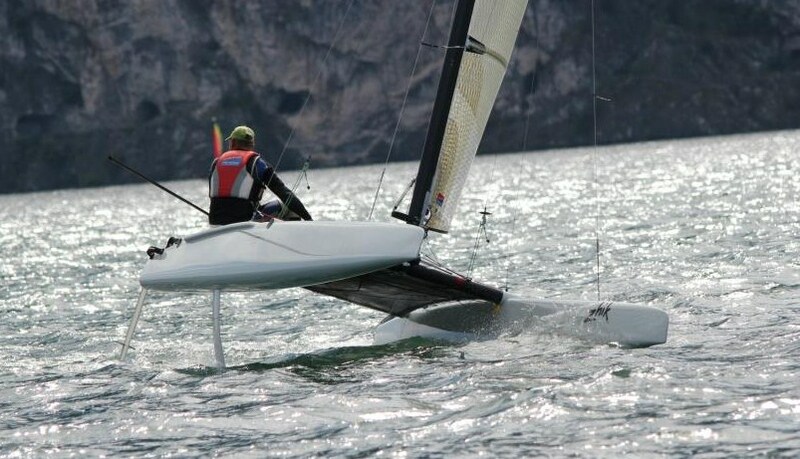 This training method was also used by Austrian & Argentine Tornado Olympic teams, although design aspects were not discussed, but of course sailing and training together gives you lots of feedback. Needless to say Hagara-Steinacher are double Gold medalists, and Lange-Espinola double consecutive Bronze. Training with your best competitor it surely pays. 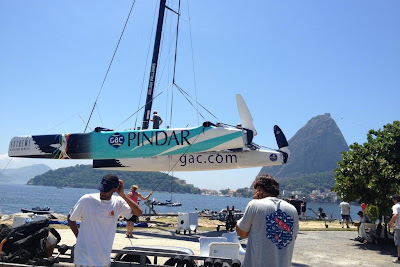 As they can test the proven foiling solution against a non flying one between the two boats, that is going to be the key, as not OR or AR teams have the foiling option secured. Oracle cause they destroyed their AC72 after too few testing days, and Artemis as they went for a non flight setup. As remarked once, fine tuning of the curved boards is going to be key for this boat. 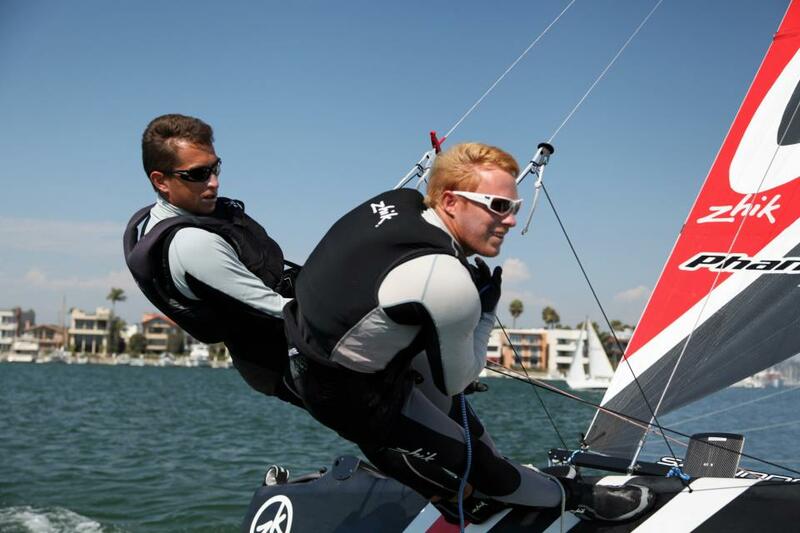 GoforGoldTeam training on the Nacra 17. I think someone need to tell them that with double trap conditions downwind you need to raise your boards no matter if you have curved or straight! Check video below for more flight time. Some video of both AC72 training on the ACup Discovered Series. Just as a first look reference and wild guess: Artemis looks smoother and ""faster"" than these two AC72 in non foiling conditions. Below latest video from Artemis. Today I received a call criticizing the lack of posts and the 'awfull' last one.. ha! 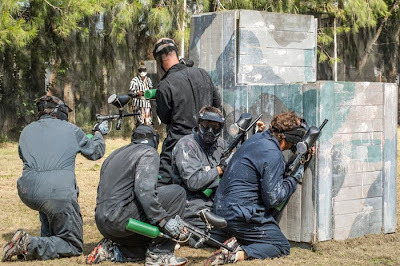 I thought it was cool seeing the guys having fun. But too I'm busy building cats, RC16s, with some deliveries pending. I took a break to write this, but we have really good info this week on the Paradox/Valenza interview, Backes confirming he will campaign for Rio and the final list of the Youth Americas Cup (more on this next week). Not even to start reviewing the quantity and quality of this 2012. Next week I will make a poll for some of the best images of the 2012 Season: Launay, Contin, Van Staveren, Capizzano, Leonard, Cameron, Raget, Grenier, Kauffman and many others that contibute in a big way for this website to be what it is. I've seen the Yacht Racing images and the selection is quite poor. We've seen here lots of better pics than those, so we'll try to recognize the photographers once more for the "CSN Image of Year". 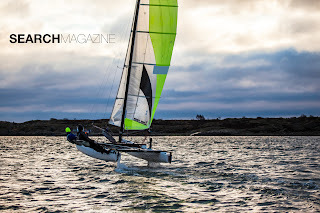 Images: Philippe Michel -- The questioned mandatory Mixed multihull slot for Rio is bringing some interesting and unexpected teams to the game. We all know who Olivier Backes is by now, a Tornado Olympic campaigner and double F18 World Champ (2010/2012) , but not many knew he is married with Ingrid Petitjean, 2010 470 World Champ and Olympic sailor too among a long list of achievements. 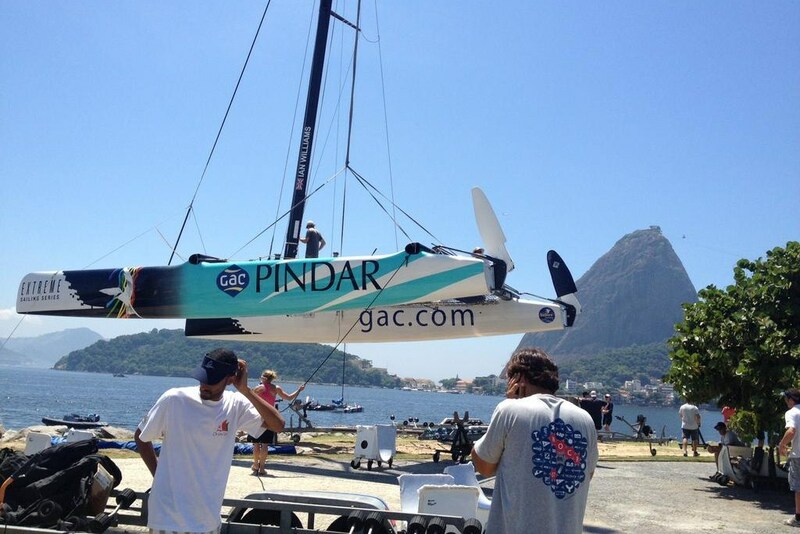 Now they have decided to join forces on the water to start training on the new Olympic cat, the Nacra 17. They made their official presentation on Monday so now we can spread the news. I guess they will race in the F18 too as many other mixed teams will do for their 2016 project. 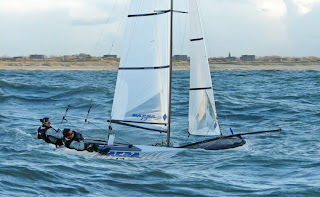 "We came last Friday to Nacra Europe in Scheveningen to try the new Olympic class, the Nacra 17. Even though the weather was not ideal ( 5 degrees, rain and strong wind), we had good fun sailing in the Nacra 17 together! The boat feels good, it's closer to an F18 than a Viper, the main difference are the curved centerboards, it s' going to be a little tricky to find the right position of them to be able to have a fast and safe boat. The class rules have just been posted last Friday, and the class association will be done early 2013." With Audrey Ogerau / Matthew Vandame (F18 World Champ 2012 with Olivier) plus Franck Cammas aiming for Rio (more on that later) , France will have a strong team chasing for a medal in 2016. Hope Carolijn can campaign also to have a super competitive Mixed event. Check the video for some good bow pitch recoveries... 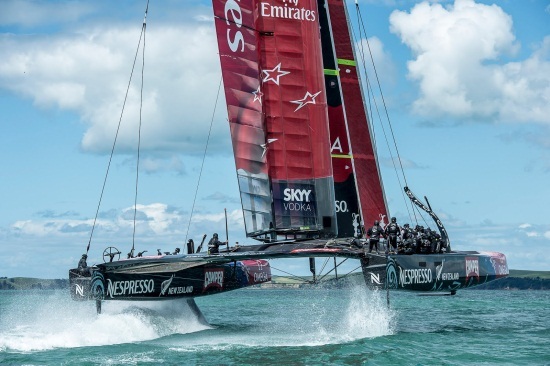 If Emirates Team New Zealand can be competitive in subFoiling conditions at SF, this Cup right now, is a closed deal. New ACat from Australian based Carbonic Boats. And yet another racing cat designed by Martin Fischer. Seems Martin is quite busy these days on many projects, several of them featuring his S dagger / L Rudders setup. 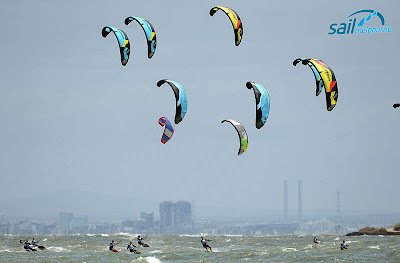 The Extreme Series had an excellent choice of venue for the final 2012 event. Rio is one of the most beatifull & cool cities on Earth, and as I said many times, too few people are more fun & cooler than the Brazilians. Rio 2016 Olympics are going to be epic. The Wave Muscat only ,2 points ahead of Edmond de Rothschild for Rio crown. Nice to see Torben Grael on a cat too, remember his brother Lars Grael was an Olympic Tornado medalist, that sadly lost one his legs in a power boat incident cutting his carreer, although he continue to sail in excellent level, in the Star class for ie. Live Replays on previous posts. We've seen lots of full foiling cats recently, even Icarus was foiling 30 years ago. But still full foiling in cats is only experimental and has not been successful in Course Racing against traditional 'floating' cats. The only exception to this rule might be ETNZ, but they still have to win the LV to prove the concept will work in any wind condition, they are looking quite good but Artemis has a word or two on this. Not even mentioning Oracle 'reverse lift' bareway disaster. 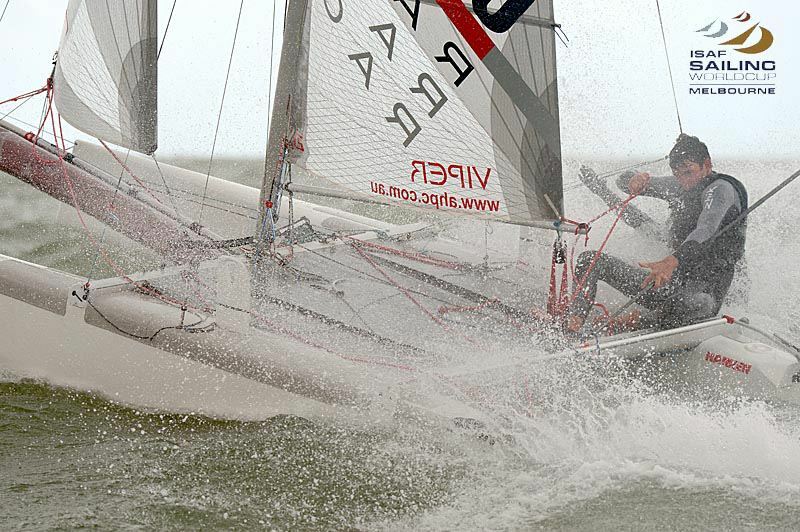 The great flying Tiger photos distributed by Search Magazine are just great fun, they even report 32knots! But take a look to those huge foils. 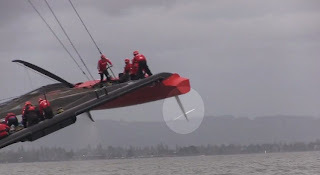 Those foils could lift Artemis AC72 without much effort! But any chance that conf would be competitive in the 5-12 knot range in course racing? It is a one chance bet as the Tornado Code Zero was at Beijing, that ended with total failure. More refined solutions have arise with Fischer S + L rudders foils on the MayFly, Flying Phantom and now the GC32 . Dario Valenza is giving the concept a new try in the Paradox A, but is going to be a tough endeavour, as if you cannot still fly consistenttly on the Phantom, and the GC32 is still to airborne, achieve an overall performer with an underpowered ACat is 'madness' right now. Full foiling as we've saying here for a while is right now for special projects like the Hydroptere, WhiteDragons and many others. We all like these projects, and I will continue to publish and promote them, and along the "Fischer Conf" they are the base for future efficient foil course racers, but right now don´t hold your breath waiting for a magical solution for Course Racing. 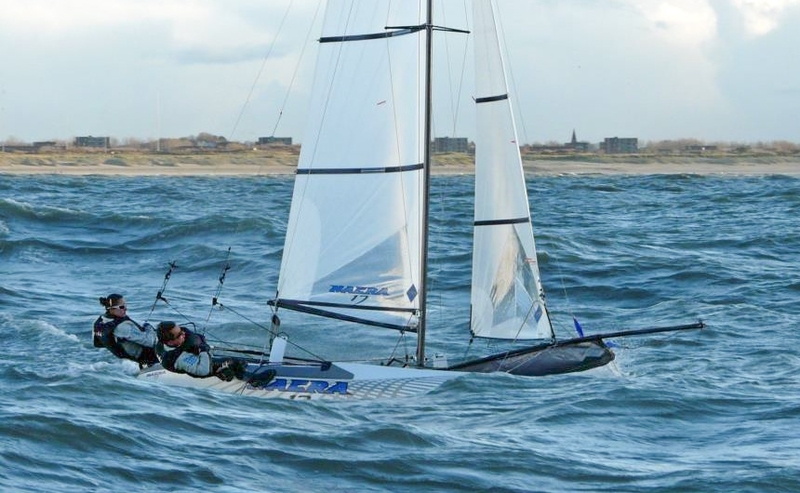 1st Image, the Tiger losing its windward foil due to a dyneema failure, this was sent to me yesterday by Search Magazine to explain why they only have one foil. Below, initial Tiger conf before testing. 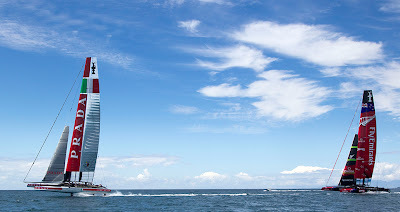 Although Juan K/Artemis has one of the major CFD machinery in the business to simnulate almost anything you can think off it seems they are running behind in this Design AC72 race. After a main helm wipeout, but replacing with unquestionable Multihull sailors like Loick, Nathan and Santi, Artemis is now testing some modifications to their rudders. Similar to the Winglets the As have been using for a while, even Mischa also used to win the 2012 title, Plus Baier & Landy (left his rudder setup). The winglets on the Aclass are being reported to stabilize the boat downwind in the breeze. Clearly not designed to foil at first glance, but you must imply that this is a second thought on the rudders and their overall conf. The boat looks quite fast, but of course we don´t have any reference. The great thing about this Cup is how all will trickle down to 'beachcats' in the future wether foiling or not, some new developments will rise and the entire sailing community will benefit. Meanwhile Artemis is catchiing up, today they went sailing again, below footage from past Saturday. "Hi, thought you might be interested in what´s going on in Sweden right now. 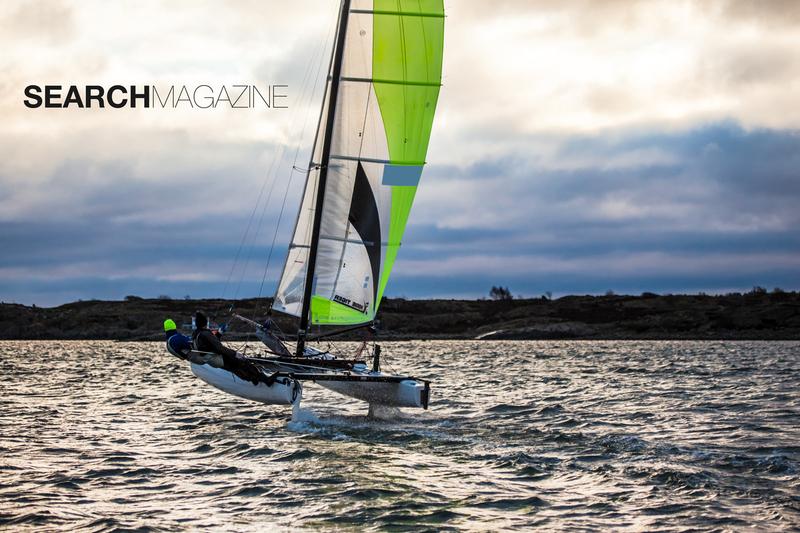 Due to the lack of foiling from our Swedish AC syndicate Artemis, the Swedish sailing magazine SearchMagazine (feel free to link to our website www.searchmagazine.se) decided to take the matter in their own hands and get the Swedish flag flying! 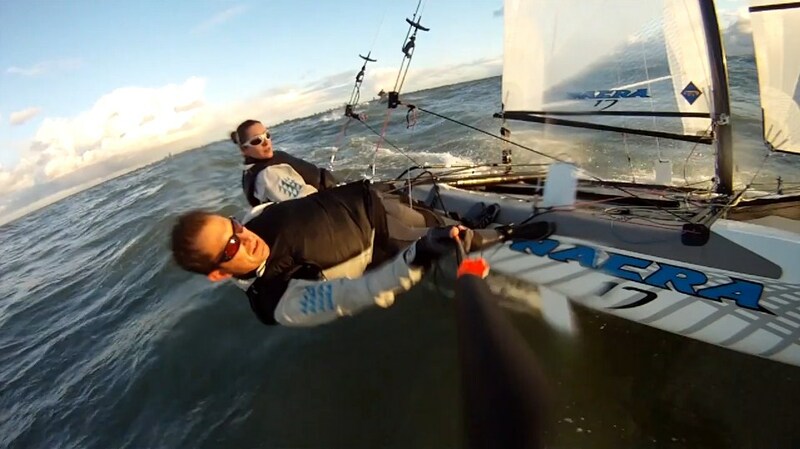 We put foils on a Hobie Tiger F18 and started to try foiling in late November, with 2 degrees Celsius and 16-18 knots of wind. On the second test session we manage to get some good foiling and the top speed reached 32.1 knots. 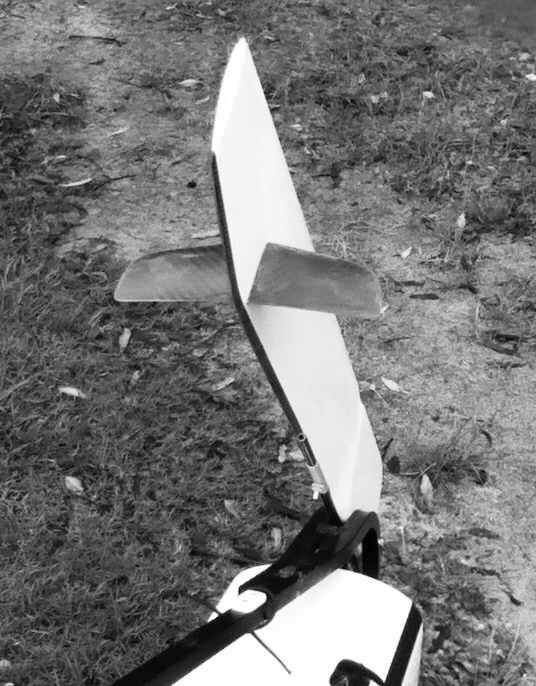 We started with foils on daggerboard and rudder originally designed for a lighter boat, eventually the rudder foil broke but the boat continued to fly. After 30 minutes of sweet flying around feeling like the Kiwis the daggerboard foil broke as well and the fun was over. Repairs and reinforcements of the foils are already started and if the ice doesn’t prevent us from sailing, we will try to go flying again during the winter." I've been requested by the International A Division Catamaran Association to maintain the content of their new website. As CSN has become a daily work with lots of hours dedicated to continue improving it and keeping the pace I accepted as I can complement it quite well with Catsailingnews, even gathering more first hand info from the As thus generating a good synergy that will benefit both sites/viewers. 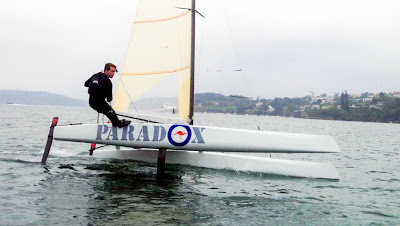 First article will be Dario Valenza interview on his new Paradox. 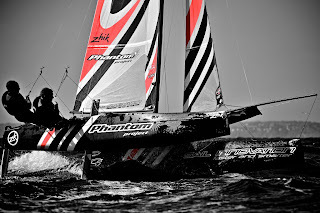 Photo above, Nathan Outteridge who will be Artemis AC72 helm for next Cup along Loick Peyron. Nathan has grabbed the A-Class feeling quite fast, the same on the AC45s, coming from the 49er is a plus, but his rapid growth on the As, even in hurricane conditions as seen in Florida last Worlds will be a key asset for Artemis at San Francisco. Full insight design interview with Alex Udin made here in Buenos Aires some weeks ago after LA Worlds. Purely design talk, on the rule mess I will just repeat that the class needs to act on time to protect the sailors, and the builders need to take full responsibility for what they deliver. Had a long talk with Pablo Soldano in LA too about this, and he has the same view for an inhouse certificate, Pablo also agreed we need a more professional managed class to adapt to current times, good will is not enough anymore. Pablo's interview is in his inbox to be approved. On Udin you can hate or love this guy, but what you can´t deny is that some tough work is being involved on his projects, and I think is good to have someone pushing the limits, as it force the rest to keep the pace and also it is a great ingredient for one of the best assets of the F18, different brands racing together in a leveled field. So those interested in design talks grab your cup of coffee , as I've been told many do every morning and enjoy some juicy detailed insight on the birth and full cycle process of the Phantom F18. Alex Udin: Amazing, awesome! We had a challenging project for the last 24 months as we launched the Phantom nearly 2 years ago, it was not an easy project as we started from scratch as boat builders. I had some idea of the windsurfing industry , not bigger boats , but fortunately we have a great team with Martin Fischer as the designer. - You established that working relation with Martin for the Wildcat right? We started working together since 2010 for the Erquy F18 campaign when we chose the Wildcat. We end winning the title with Olivier & Arnaud and we decided to start a new boat project with him. We were quite happy with the boat but we had several ideas to make the boat better , faster but basically easy to use. 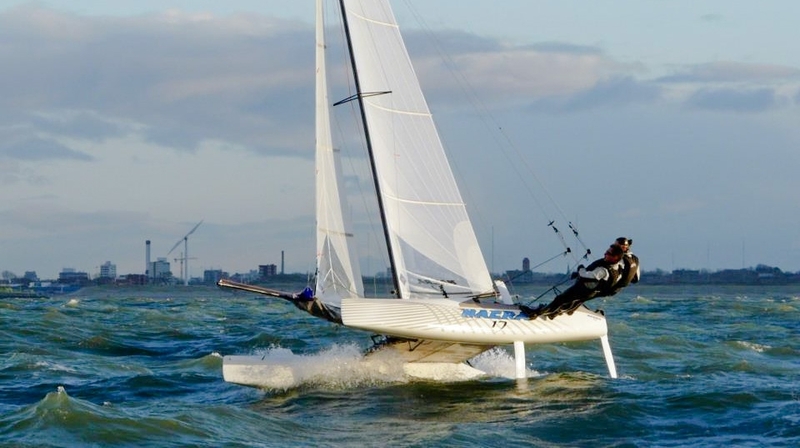 - The Wildcat as I mentioned on the blog several times is the best boat I've ever sailed/raced (vice SAmerican Champ with Esteban Blando on it) a performer and a really a sensitive boat, above 17 knots you need to be quite concentrated on the helm. I remember Olivier commenting on having a boat that can perform like the Wildcat but also being able to concentrate in the course racing in high winds, that was your target with the Phantom? 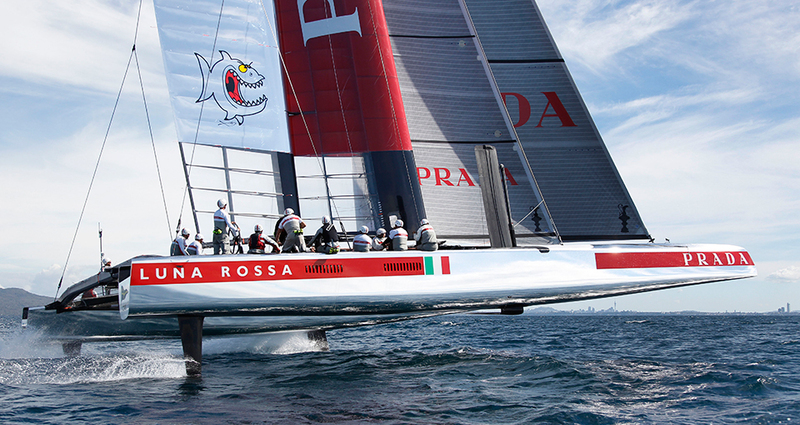 Yes, a racing boat should be fast but easy to use to being able to concentrate on the course. 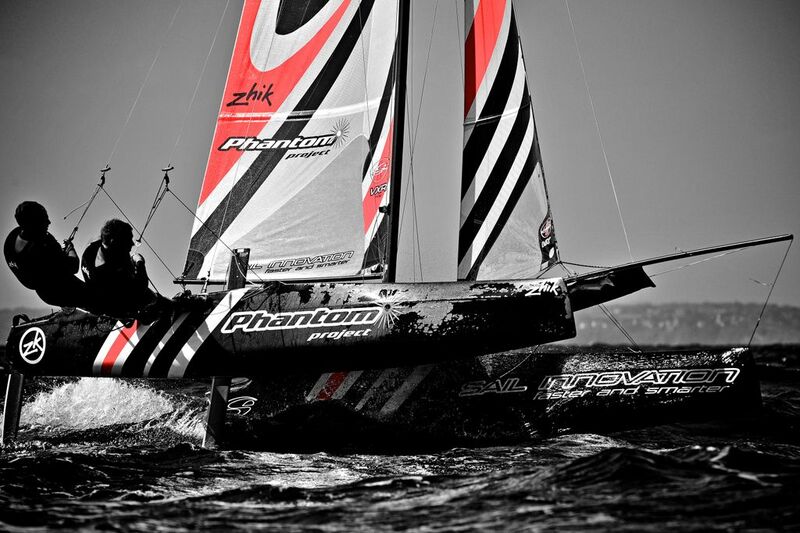 - Which areas beyond easy of use or more margin you work on the Phantom? You already had a good rig. We have a proven rig/sail combo, so we focused on every little detail on the boat, these details can make big differences in the end, we focused first on the hulls, to reduce the drag and also to improve the forward-aft stability of the boat to reduce the pitching but also the nose diving so you can push harder downwind , but also to have the fastest boat upwind as we believe with Olivier that if you lead upwind you probably made 80% of the race. - And how you achieve that? A boat easy to manage on the start? It is a compromise, we decided to increase a bit the chord of the daggerboards, we went from 18 to 20cm . 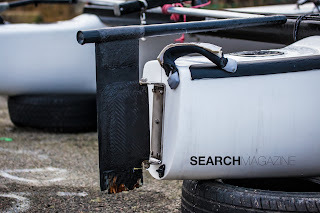 If you reduce the width of the foil, specially the chord you achieve less drag and more speed , a faster boat in straight line with narrow boards. - More chord gives you a better grip on the start? Your speed on the start is around 1knot and with wider boards you get less leeway and you can hold better to your position, and that is a big problem cause in that start line it reduces your option for the race, Olivier was complaining that at Erquy he always had to go to the pin. We are happy with the new wider foils and how Olivier can manage his starts. Also the position of the dagger case is quite important. - I know you did lots of tests on that and change a few times right? - Which is then the theoretical concept gain behind moving the daggercase forward? - And which is the benefit of that? It means that instead of only having the rudder dragging, you assign more lift and load to it, as you have a certain rudder size you need to maintain, if too small you can control the boat for instance. 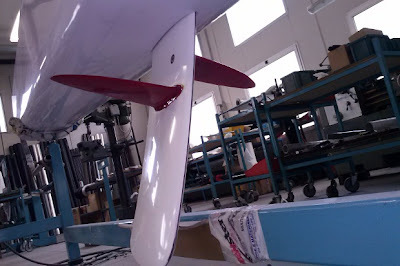 So the idea is to make also the rudders generating lift in addition to handling, combined with the ability to rise the boards earlier you achieve less drag ratio. - But it didn´t work that fine at the early stages right? Yes, too much load , the angle of the rudder on the start was too high so it was stalling, more in the start when you have your weight forward , in the bareaway they were stalling. Yes, we move the case s20cm backwards and it totally changed the ability of the boat to tack . We also made some test on gybing boards, with good gains upwind but not downwind, so we decided to leave them straight, but we are going to work in the future more on that. - What else did you tested? The rig is quite important , we think is more than 60% of the boat performance, we decided to go with a stiffer mast , specially sideways which is good for the power but is a compromise with the softer masts like the C2s when you get a more forgiving ride . You can pull harder the mainsheet, you don´t need to be release and the rig is like auto adjusting by itself , it is really good. But in choppy conditions when you need the power and healing moment you are losing a little bit of power. We went to a stiffer mast and adapted the sails accordingly. 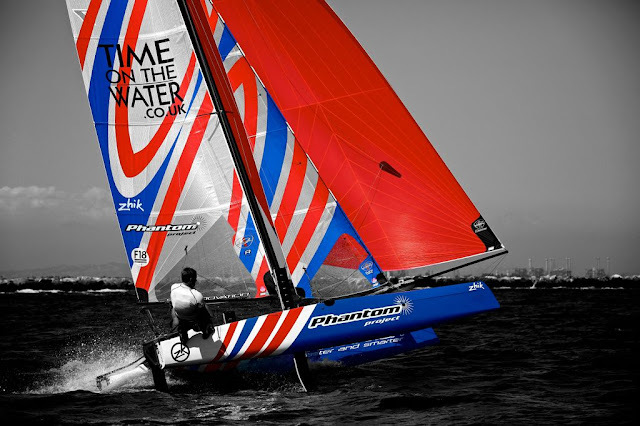 Stifness of the foils are key too in my opinion and we are also the only production boat with hollow rudders/daggers, made in autoclave making them pretty light, strong and durable. These boards make the boat faster specially in light to medium winds. - What about the platform stiffness? You are using Cirrus beams right? The stiffness of the platform is another key factor , yes the beams were designed bi BCM, we are really happy with them , they provide a better connection with the hulls, and you can integrate these beams to the platform lower than any other on the market due to their special design. - These beams were designed by Manu? Yes, and the connection reach almost 70% of the beams area attached to the boat giving you an optimal attachment between beam/hull. - What about the building process? The entire building process is being made with vacuum, the outer layers, the foam core and final layers, all made with vacuum. And we made structural analysis with G-Sea design to improve boat framework stiffness and torsion and inflection. All the structural layout , subdeck and lamination were made by them. the type of fabrics, the unis direction and weight were carefully analyzed also. We tried to work hard in every detail, and all these little details in the end make a great difference. The gelcoat doesn´t makes the boat stronger, is dead weight, so we decided to use paint and reinforce the laminate schedule giving us a better use of the class rules in the benefit of the final sailor that will receive a more stiffer and stronger boat. - Working with Martin Fischer you had access to some serious cfd tests, how was that process? 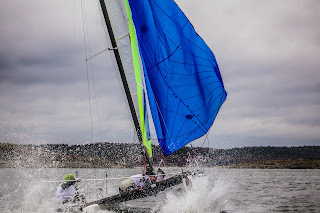 We did lots of cfd tests for the hull and we did some benchmark tests with the boats we had, and one of the benchmarks was the Capricorn performance upwind, we believe that it was probably the fastest upwind right there with the Wildcat (both Fischer designs) . We also did cfd tests against the other boats , along Olivier and Arnaud feedback on the several on the water tests done. It gives you a good reference, so we went with two hull shapes after al these tests , one with a rally flat section in the bottom like the Cirrus , but the results were that upwind and in normal wind conditions doesn´t brings any additional gain and even increase the wetted surface , it has some good assets like increase aft-forward stability downwind creating lift on the front of the hull. We look at the new ideas of the Cirrus and took a compromise solution, in fact all the current boats are very competitive and designs are quite alike, so the gap is not so big. - I've been writing for a while on the blog now, it is not possible to come out with a magic shape that will overperform the others at this stage of the F18 development. Is not possible, you can´t right now improve by a 10% on hull shape for ie , at the end we had to make a choice between an allrounder, but we chose to go for something little bit more extreme knowing that the safest all round option will be sligthy faster in every condition but we decided to target , based on the statistics we made, the 8-16knots range , optimizing the all the design for that specific range, meaning we wouldn´t had the fastest boat in calm, specially less than 6knots, we knew that our boat is not that efficient there. This work ended on reducing the drag 4-5%for the mid range, but knowing what we were giving away in -6knots. - In LA we had almost every single condition, calm with chop, perfect breeze , 20knots and dead calm the final day. We went for top ten results on the calm, and expecting the breeze to come to take full advantage of the design in 1 to 2 trapeze conditions. One the the characteristics we look a lot was the prismatic coefficient, that is the difference between the biggest section of the boat, probably in the middle and the slender part of it. You reduce the pitching increasing the fore and aft stability and you reduce the drag at certain speeds but as a compromise you increase the drag at low speeds in calm, specially in the transom. 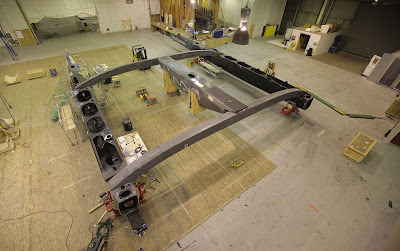 - I compared the Phantom transom at LA, and it is huge, not as big as the Cirrus but still quite large.. The transom is 3-4 cm wider than the Wildcat , the same for one meter behind the bow , 4-5cm wider there. So the width is exactly the same but we add some volume on the back and front of the boat. - But there you have a compromise between good speed and handling? Not so much cause we already use big volume and the hulls sits high on the water , the manoeuvrability of the boat is really good. So the in this area was straight rocker, added volume plus a flatter section in the transom but a more rounded in the middle, this derived from our cfd tests, reducing the wetted surface amidships and flat again in the front. Another key factor was the freeboard of the boat, we increased by 5-6 cm the height at the back / front beams from other designs . Finally I took care of the cosmetics aspects of the hulls, the outline, the deck layout and diamond shape of the bow etc. Yes, we took it from the Audi A3, and also makes a more easiest way to construct the hull, as a deep rail is tricky to build. - Which is the cost difference for the Phantom regarding the others? - How do you feel after all this work, and grabbing a 2nd World Title now with a SI 100% equipment? It has been a tough project , not easy with all that happened with the class and everything , I was like the bad guys and treated as a criminal the last years, really bad times for me , that made me think on the investment I've made in the class, more than the money , all the time we have put on the project. But the team kept focused, I'm really proud of the team, every single guy working with me Oliver, Arnaud that went to the ACup and I'me very happy for him, and this year we had Matthew , a really good guy , one of the best guys I know, a good friend of mine, he comes from the Tornado and with Olivier the formed an excellent team, they respect each other. Recently Hugh Styles joined the team, funny cause he was one of our main competitor in Erquy, a very good sailor , for sure the best at Erquy, it was really close and lucky for us he had that incident. We trained quite hard in LA as a team, the goal was to get all the team in top places , he was one the fastest boats of the fleet but he had some bad luck again at LA, with one daggerboard going below deck level and damaging the daggercase. But Hugh is clearly one of the best sailors out here. - Plans for next year? 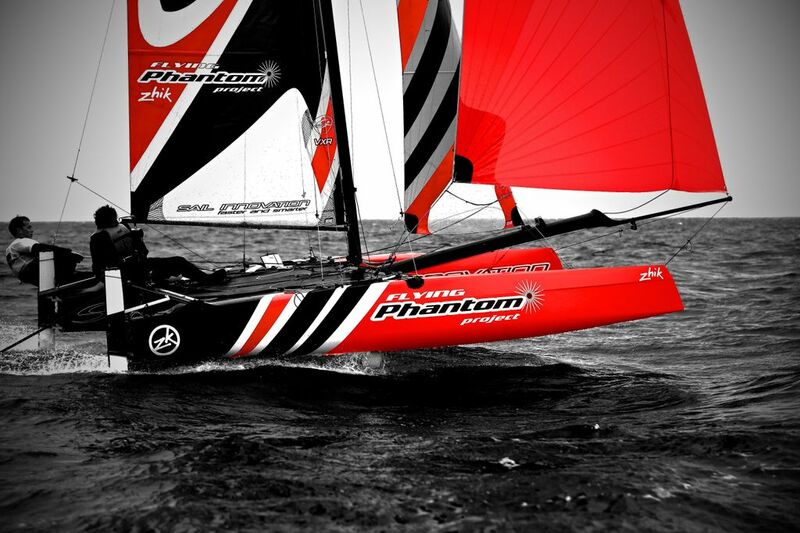 After a great success of with the Phantom we now have to continue pushing forward and building more boats. - Any other dream for the future, like the AC? AU Yes, but entering the AC is a lot of money and a really tough project to be involved with, and it is a matter of networking and relationship with the AC guys. - And in the short term? How is Flying Phantom doing? We've been more concentrated on the F18 Phantom project last year, as SI has not many people we will focus on the Flying Phantom more from now on. 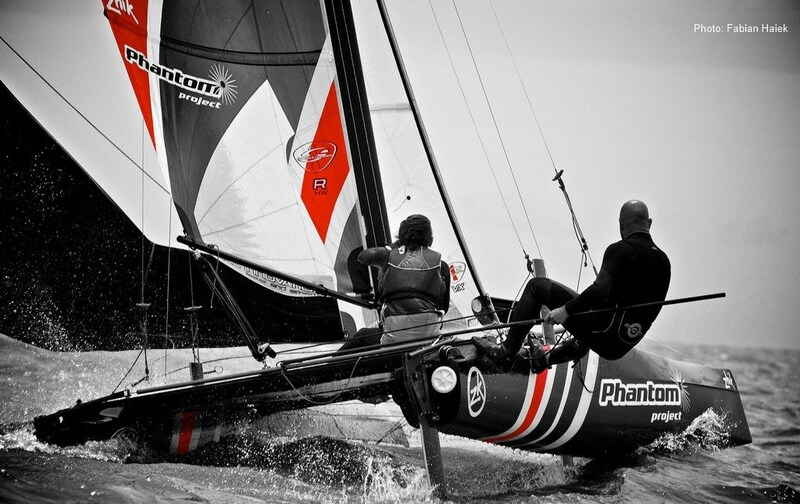 We have recently started to work together with Franck Cammas and Groupama sailing team in order to set up and develop this new generation of flying boats. It is a great experience to work with them and Martin Fischer which is also involved with Groupama team for a while. I really believe these types of flying boats could be the future of our sport, it will take a bit of time to get it right but I am sure it might revolutionise beach cats.